"Look, you better come up with some ideas, because we need programs for this week." 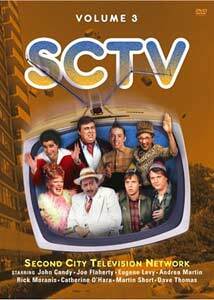 After three seasons in a half-hour form on Canadian television, SCTV moved to NBC in a 90-minute format for two seasons. This third DVD volume collects six episodes from the end of the fourth season (the first on NBC), plus what seem to be the first three episodes from the fifth season, once Martin Short joined the cast, though the packaging only refers to the fourth season. The basic format is the conceit that SCTV is an actual shoestring television network run by fraud Guy Caballero (Joe Flaherty), with recurring characters such as egomanical star Johnny La Rue and fishing show host Gil Fisher (both John Candy);annoying leading man Bobby Bittman and frustrated newscaster Earl Canembert (Eugene Levy), whiny producer Edith Prickley and huckster Edith Boil, Canadian brothers Bob and Doug MacKenzie (Rick Moranis and Dave Thomas) and sultry songstress Lola Heatherton (Catherine O'Hara). While some of the shows are devoted in substantial part to the running of the fictitious network, most of these episodes are comprised of the shows supposedly airing on SCTV, running the gamut from the inept to the bizarre (such as the drawing class hosted by Salvador Dalí). The comedy is almost entirely character-driven rather than being built on gags and jokes. Where that works well (especially with John Candy's characters and the MacKenzie Brothers), it's pretty entertaining. Other segments don't fare so well, especially ones that start off as a high concept and then really have nowhere to go. These include the soap opera parody "The Days of the Week", which adheres so closely to the model that it loses track of the humor completely and becomes what it's supposed to be satirizing. These endless segments aren't made any more palatable by their repetition three times: once in the upcoming promos, once in the show proper and again in the recap. These get pretty hard to sit through when watched in close succession and feel a lot like filler. One suspects that by the end of Season Four the creative team was running out of steam by having to come up with 90 minutes' worth of material every week. That's reinforced by the much better quality of the last three episodes on the set, coming after a summer hiatus, though the injection of Martin Short into the cast probably gave some new creative fire to the group as well. The impersonations really take center stage here, with Catherine O'Hara doing a devastating Katharine Hepburn and Short nailing the dark side of Jerry Lewis in a spot that Lewis himself apparently resented very much. However, some of the funniest bits are reserved for the guest stars, with Mean Joe Greene doing a humorous sendup of his post-football roles as pitchman and inspirational figure. The always-entertaining Bill Murray offers some clever material in the final program of the set. There are some memorable segments even though the package as a whole is a little disappointing. Bob and Doug MacKenzie prove that they work best in a two-minute improvisational segment when they're given their own full-length special, Great White North Palace. Spielberg's revisionism of Close Encounters of the Third Kind is skewered in the special edition of the The Merv Griffin Show. Coppola also gets a roasting for his self-indulgent opus, One from the Heart, reimagined as a 3-D horror film. One of the high-concept pieces that is pretty entertaining is the War of the PBS Stars, featuring, among other competitions, Fred Rogers boxing with Julia Child. Rome, Italian Style features a satire of Italian films that will provoke a smile in the foreign film fan, right down to a tossed-off pan-and-scan joke. As usual for the NBC run, there are some musical guests, including Carl Perkins, Hall and Oates, Tony Bennett, Dave Edmonds, and Jimmy Buffett. Most frequently these get a workout with Gil Fisher, The Fishin' Musician, allowing them to take part in the sketches and be more than just a variety act. The set is once again fairly pricey, due to the need to clear a great deal of music that wasn't properly licensed in the first place. A couple episodes run a few minutes short due to licensing that didn't get done; most notable of these is a segment featuring the polka-playing Schmenge Brothers (Candy and Levy) doing various versions of Stairway to Heaven; since Led Zeppelin refuses to license that song, the segment would have made no sense and is cut altogether. A few other bits utilize replaced music but this is probably as complete a set of these episodes as rights issues will permit. Image Transfer Review: The full-frame picture is rather soft and feels like the victim of excessive digital noise reduction. Color levels are rich and well-saturated. Black levels are good though shadow detail is often a bit plugged-up. It's not bad for television but nothing to get excited about. Audio Transfer Review: The audio quality is quite good, with the stereo track having a nice wide soundstage and excellent clarity and presence. Dialogue is plain at all times and the musical guests come through with very wide range and without clipping. Hiss and noise are not noticeable. Extras Review: Two episodes include a commentary. The first is on the Pre-Teen World Telethon for Pre-Teen World episode, featuring Joe Flaherty and two writers. This is pretty disappointing, with little content and devoted primarily to the three guys laughing at their own work. That's always annoying and makes this fairly worthless as a commentary; the only notable exception is Flaherty's confession that it's pretty creepy to watch middle-aged comedians pretending to be pre-teens and acknowledging that except for Catherine O'Hara it doesn't work very well. Two writers also take on the eighth episode, Rome, Italian Style, and this one is more informative and has some real substance, though they tend to sell the episode a little short. Three documentaries are included. Most notable is an interview (29m:10s) with two producers that gives a history of the series. SCTV Remembers features O'Hara and Martin Short in a recently-taped series of recollections about this arc of the series. By far the funniest thing on the disc is the 1997 panel discussion of the surviving cast at the Museum of Television and Radio (01h:20m:00s); that probably shouldn't be too surprising, considering most of the cast has a background in improv, so this is a format where they can play off each other and really be funny instead of being stuck with over-written scripts. Finally, a period featurette from the Canadian series That's Life (6m:37s) takes a look at John Candy and his family. A still gallery of about 50 photos is largely devoted to Candy as well. Finally, there's supposed to be an audio CD with classic moments from the Second City stage show, but no such CD was included in our review copy. Chaptering is very thorough. There is no Play All option, but since each disc contains at most two episodes that's not a significant omission. An occasionally amusing run of episodes, though the sketches often run on long after they should have stopped. The longer format is plainly taking its toll on this set but SCTV devotees will certainly want it.